The UK has until the end of 2020 to change its mind about leaving Europe's single market, the European Union's chief Brexit negotiator has said. Michel Barnier said that if the UK changed its "red lines" during the post-Brexit transition period, the EU would also change its position. The UK is set to leave the EU in March 2019, at which point the transition phase - which the UK government calls the implementation phase - will begin. This will last until 31 December 2020, when the final arrangements agreed between the two sides will kick in. 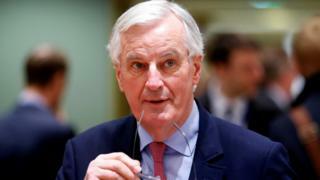 In an interview with reporters from several European newspapers, Mr Barnier said the UK would not leave the single market and customs union until 31 December, and until this date, "everything is possible". "If the UK wanted to change its red lines, we would therefore change ours," he said. The EU doesn't think the future relationship with the UK will be finalised by the date of its departure on 29 March 2019. Which means that during the transition/implementation phase the UK could change its mind - quite significantly - about what it wants and then negotiate on that basis. It also suggests that the EU wants the document sketching out the shape of the future relationship which will be agreed during the next phase of talks this year to be very, very open - not the detailed blueprint the British government seeks. It wants to agree this by the Autumn in time for a "withdrawal agreement" to be ratified by the UK and EU Parliaments by March. But the EU has suggested only a "political declaration" will be possible by this deadline. On Tuesday, the European Council's president said Brexit makes him "furious". Speaking in Dublin, Donald Tusk said the UK's departure from the EU was "one of the saddest moments in twenty-first century European history".